Estadio Anoeta replaced Real Sociedad’s old Estadio de Atotxa, which had become too small and lacked the possibilities for expansion. In sharp contrast, to their old ground, the new stadium was bowl-shaped, spacious, and had an athletics track circling the pitch. Estadio Anoeta opened on 29 July 1993 with the European Youth Athletics Championships. 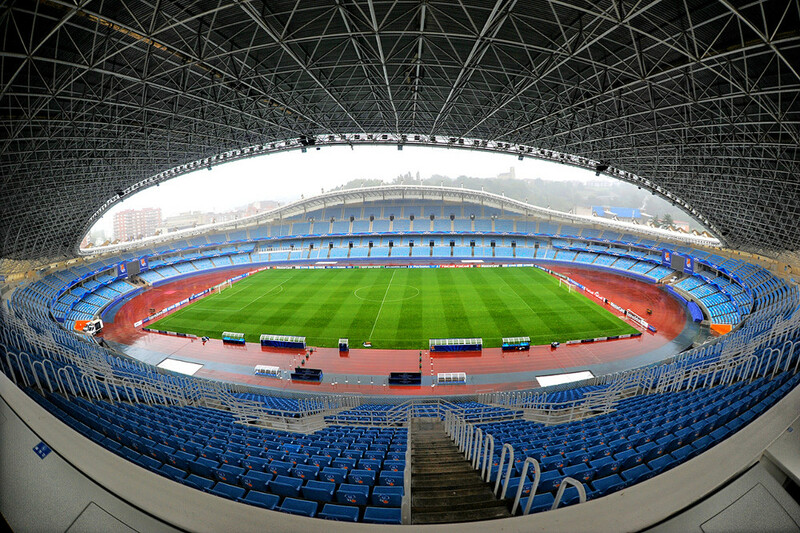 The first match at the stadium was played a few weeks later when Sociedad received Real Madrid for a friendly. The stadium could hold 32,000 spectators. Real Sociedad, tough, was never been really happy at Estadio Anoeta due to the large distance between spectators and pitch and the resulting lack of atmosphere. In the mid-2000s, the club therefore presented plans to remove the athletic tracks and redevelop the stadium, a project dubbed Gipuzkoarena, however this never came off the ground. 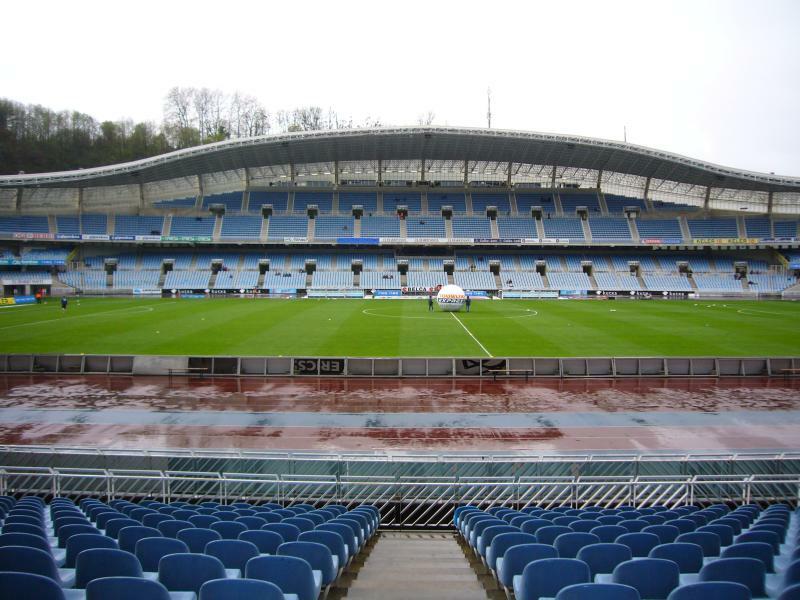 In early 2014, Real Sociedad once again presented plans for a redevelopment of Anoeta, which included the extension of the lower tier closer to the pitch, increased hospitality areas and an enlarged roof, resulting in an increased capacity of 42,000 seats. These plans were confirmed to go ahead in 2016 with works starting in March 2017. The first part of the projects, including the removal of the athletics track, the extension of the stands towards the pitch, and a new south stand, was concluded in September 2018. The entire project, including a new north stand, will be completed before the start of the 2019-20 season. Estadio Anoeta is located toward the south of the city of San Sebastián at about 2 kilometres from the city’s bay, La Concha beach, and the old town. The distance from the city’s main railway station is about the same. From all these places the walk to the stadium can be made in about half an hour. The walk from the train station where most local trains arrive (Euskotren) will be even shorter. The stadium can furthermore be reached with several buses. From the old town (stop Boulevard 9) one can take bus 21 to Anoeta. Buses run about every 15 minutes and also pass the Euskotren station (Easo Plaza). Bus 26 (to Martutene) and 28 (to Miramón) follow almost the same route. Get off at stop Anoeta. Bus 31 also connects the stadium with the city centre as well as other places in the east and west of the city. Estadio Anoeta is located in a not particularly interesting residential neighbourhood composed of large apartment blocks. It is Spain, so there are a few local bars and restaurants if you need something to eat, but San Sebastián is one of Spain’s most pleasant cities so the wise option is to spend as much time as possible in the old town and along La Concha beach. If you wish to stay close to Estadio Anoeta though, then Hotel Anoeta is your choice of preference. It is located right opposite the stadium and gets decent reviews. Alternatively, there are a few hotels a little further north toward the centre, which include Hotel Silken Armara Plaza, and Hotel Astoria 7. Both are more of the high-end type and therefore not cheap, but they are only a 10-minute walk from the stadium. 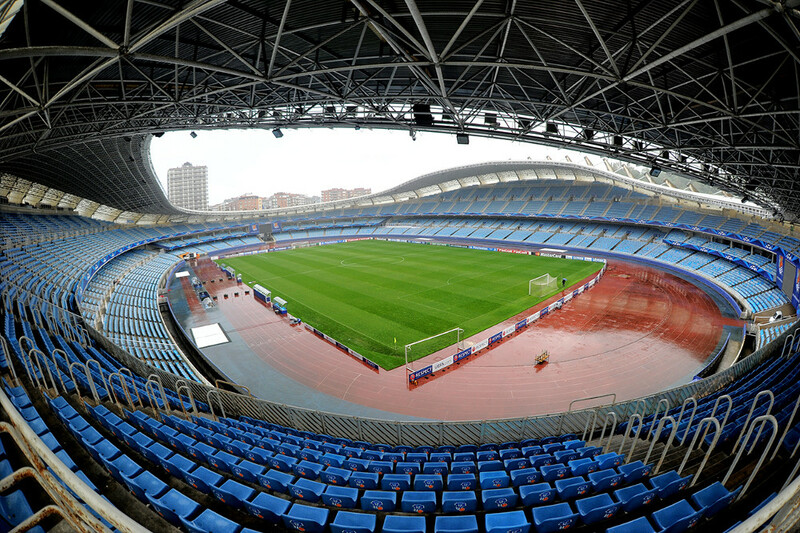 Click here for an overview of all hotels near Estadio Anoeta. Of course, there are many more and also cheaper options in San Sebastian’s city centre. 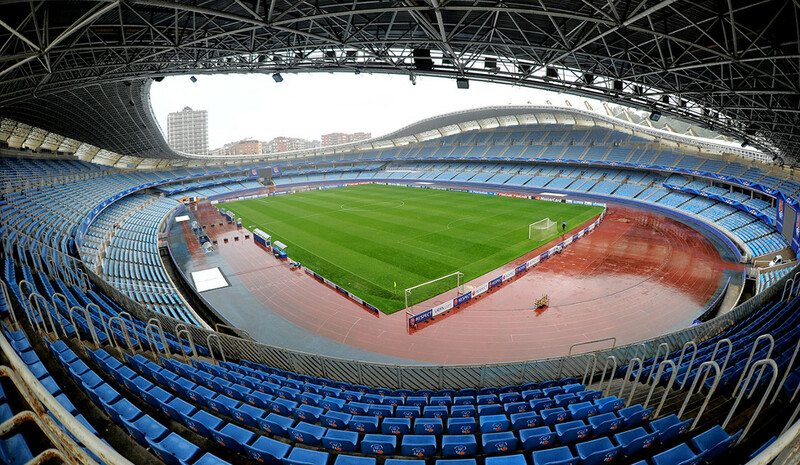 Tickets for Real Sociedad games can be bought online, or at the ticket windows of Estadio Anoeta. Tickets usually go on sale in the week before the match. Tickets are also available on the gate on the day of the match. Real Sociedad only very occasionally sell out a high-profile match. Ticket prices depend on the opponent, but a ticket for one of the curves typically costs either €25.00 or €30.00, and a ticket for the sides either €40.00 or €50.00. This gets increased for high-profile matches to between €30.00 and €70.00. Estadio Anoeta houses the Real100 club museum, which highlights the club’s history and includes the trophy room. The museum opens Tuesdays to Saturdays from 10:30 am to 1:30 pm and from 4:30 pm to 7:30 pm, and on Sundays from 10:30 am to 1:30 pm. Stadium tours are possible from Tuesday to Saturday at 11:00 am, 12:00 noon, 5:00 pm, and 6:00 pm, and on Sundays at 11:00 am and 12:00 noon. The 11:00 am and 5:00 pm tours are in Basque language. There are no tours on matchdays or the day after a match. Museum entrance costs €4.00, and the tour (including museum) €6.00. For more information call +34 943473953 or email museoreal100@realsociedad.com. Realsociedad.com – Official website of Real Sociedad. Sansebastianturismo.com – Official website of the San Sebastián tourist office. Dbus.es – Public transport information for the San Sebastián area. Coming from France, get the EuskoTren from the station just outside Hendaye train station (a few hundred yards from the border). Ensure you’re getting a San Sebastian train and get off at Anoeta.